As a young woman I was fortunate to find work that allowed me to travel on the OTM plan. I've enjoyed champagne and caviar in a chic Chicago landmark, dealt with hungry packs of corporate types in Vegas, and slept at some famous hotels in the city that doesn't sleep. For the most part, however, business travel is pretty generic stuff. Nowadays, when I travel, I seek out the unique and unusual. NOT one for over-the-top Disney-style themed resorts or thronging hot-spots, I prefer a spot off the beaten path. 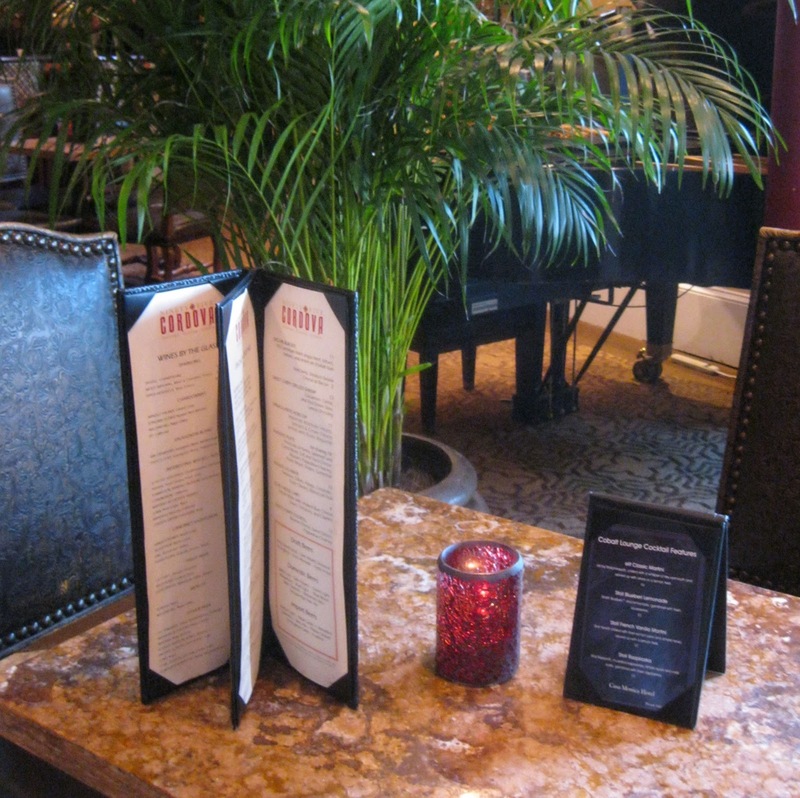 Somewhere with style, unpretentious elegance, and charm. One such spot is just down the road from our home in Florida. We're fortunate to live close enough to St Augustine for frequent day-trips - lunch at one of our favorite spots, shopping, concerts at the Amphitheatre, plays at the Limelight, visits with friends. Many evenings there have included a late night stop at the Cobalt Lounge at the Casa Monica Hotel. Live music, cool drinks, and an ambiance that transports you to another place and time have kept the Cobalt Lounge on my short-list of recommended spots in St Augustine. 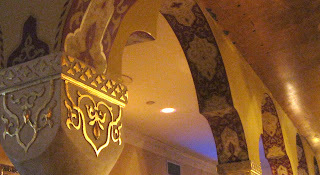 Recently, I was invited to return to the Casa Monica for a dinner at their flagship restaurant, 95 Cordova. A complimentary overnight stay in one of the hotel's premium guestrooms made this an even sweeter deal. The Casa Monica is a restored 1888 landmark hotel, listed on the National Register of Historic Places. 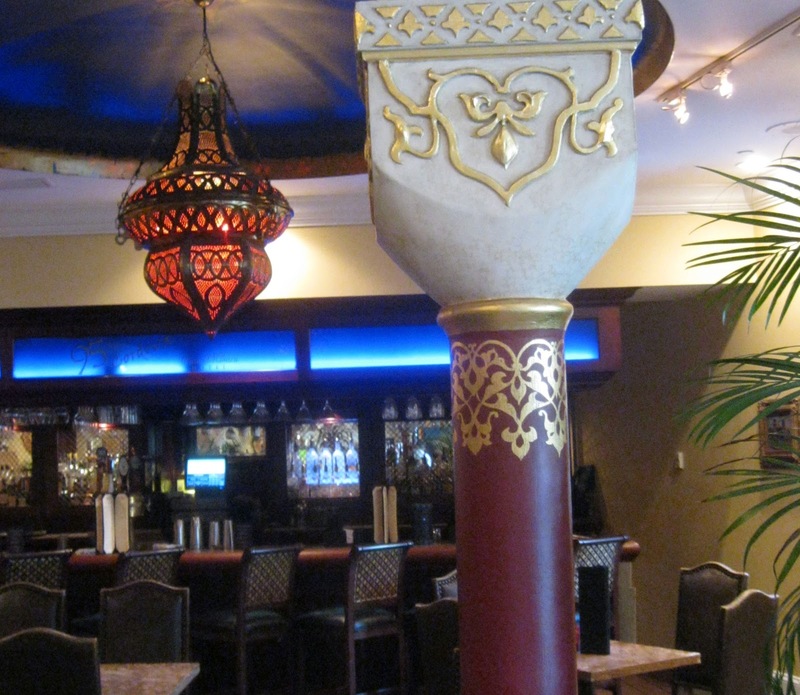 St Augustine's only AAA Four Diamond Hotel, its location in the heart of the city makes it a great spot for a getaway OR hideaway. If you want to melt into a comfortable bed in a posh, quiet room overlooking the town square, or drop your bags in your suite and launch out to explore the Ancient City, Casa Monica offers the best of St Augustine. The Casa Monica is a member of the The Kessler Collection – a portfolio of uniquely themed hotels and resorts. My stay was thoroughly enjoyable. The room was handsomely appointed, the view impressive, and the bed heavenly. What really set the experience apart, however, was the people. From the front door to the front desk, the valet parking attendant, the chef and restaurant staff, everyone made me feel like an honored guest. Dinner was served banquet style in the private dining room, with several fellow bloggers and members of the media joined by the food and beverage and catering managers. We were treated to several courses, some of which are available on the regular menu, some were created for the occasion by Executive Chef Harlan Walden and Executive Sous Chef Tim Haire. The starter was the hotel's signature appetizer - Kessler Calamari. Moroccan flavors make this unique preparation a standout. Topped with Asiago, fresh cilantro, tomatoes, olives and a Moroccan aioli, this dish was my favorite of the evening. Apparently every Kessler Hotel has this on the menu, so if there's one near you, go check it out for yourself. 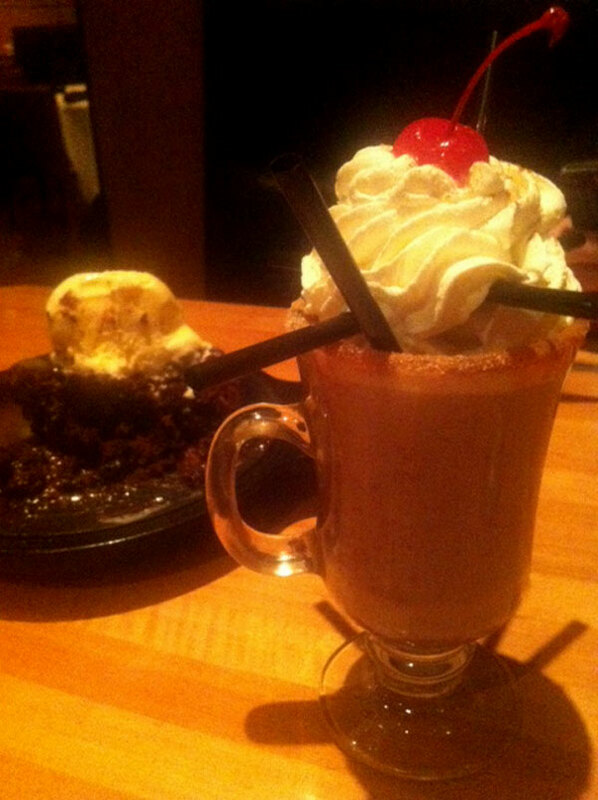 When I return to the Cobalt Lounge, it's what I'll be ordering. The Seared Duck Breast with blackberry compote and crispy Yukon gold potato hash was topped with tender baby corn shoots, which everyone seemed to be charmed by. They were an artful addition to the composition of the plate. 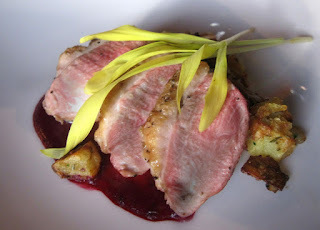 I adore rare duckbreast, but my dish was a tad undercooked - a hazard of banquet service. The fat hadn't rendered out, and the flesh was a little too chewy. The potato hash was delightful though, and the berry compote was a lush accompaniment. 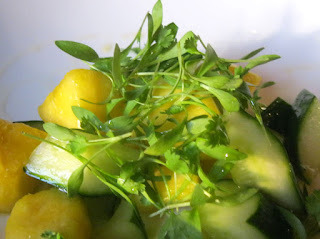 A pineapple cucumber salad was garnished with baby cilantro and paired perfectly with a Napa Sauvignon Blanc. The sweet / salt flavor profile was pleasant and the cool, crisp cucumber complimented the lush, sweet pineapple nicely. Another sweet / salty dish, an Intermezzo of watermelon granita followed. 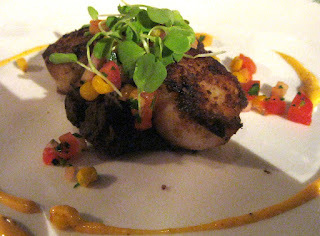 Coriander crusted Sea Scallops came to the table resting on a bed of whipped black beans and roasted corn salsa. The scallops were plump and the black bean puree was flavorful, but I wasn't completely won over by the dish. I felt the fragrant coriander crust overwhelmed the scallops, and was a little heavy on the salt, but I give points for originality. 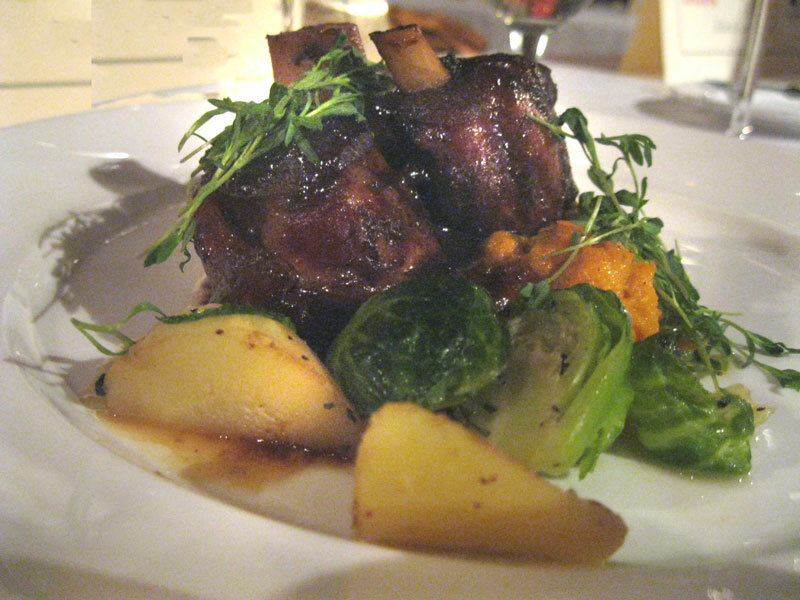 Our final protein course was a tender Braised Pork Osso Bucco accompanied by truffled sweet mashed potatoes, roast brussels sprouts and parsnips. The enormous pork shank was fall-off-the-bone tender, and the glaze seemed to have some Asian five-spice notes. The perfect truffled mashed sweet potatoes were the essence of autumn. The brussels sprouts on my plate, however, and the accompanying parsnips, were disappointingly under-cooked. I love brussels sprouts, but when I popped half one into my mouth I found it was practically raw, and tasted heavily of sterno. I sliced into the parsnip next, and it was almost too crunchy to bite into. I got the impression that the vegetables were being considered more photo-props than sides. The dish looked lovely, and I assume that under different circumstances, during a regular dinner service without our foodie-paparazzi act to consider, this would be a stellar dish. Dessert was a chefs creation of Earl Grey Panna Cotta, served with macaron and fresh berries. This was a winner - and I am fairly sure I lapped up every bite, despite being quite full from the previous courses. The view from my room! The evening was made even more special by our gracious hosts, who gave us a reception and tour of the hotel in addition to this splendid dinner and accommodations. While some of our crowd moved on to enjoy the nightlife in St Augustine, I made a beeline to my room, and dove into the incredibly comfortable bed for a restful night's sleep. Late checkout in the morning meant time to enjoy a cup or two of Starbucks coffee in my room, then a short drive up A1A and I was home in time for lunch. Thanks again to the staff at Casa Monica, and 95 Cordova, for a most enjoyable escape. I will always disclose when I have received free food or swag, but I will not allow said gift to color my opinion or reporting of the food and experience. I attempt to share in plain terms what I do and don't like, and if I like it, I will urge you to try a place for yourself and form your own opinions. I'm not a trained chef or expert in any food related field, I just appreciate the social and cultural aspects of good food and dining experiences, and I enjoy sharing them with you through my blog. Thanks for reading! Once in a great while I'll sit down to a big plated restaurant meal, but my preference is to pick a couple of items from the appetizer menu, or head to a Tapas style place where everything is meant to be shared and savored over drinks and conversation. So when I heard that swellegant III Forks in Tapestry Park was re-launching their Bar Bites menu, I was a happy camper. An invite to sample (for freebies) said menu - that had me singing hallelujah! Along with several like-minded friends, my mission was to taste every last item. Tough work, but I was up to the task! What follows is my personal opinion. You should check out the menu for yourself and definitely get over there soon! I like the social aspect of sharing food, and I guess it helps that I'm not a total germaphobe. I don't care for the double dip, however, so I'm inclined to say get your OWN BOWL of Blue Cheese Taro Chips. You're gonna want to sop up every bite of that creamy Point Reyes Blue Cheese sauce, but share it, and you'll have room for some other stuff too. Or take them home for a midnight snack. There was a lot of coveting happening over these babies. Duck & Waffles! - You heard me. Don't even THINK about touching my plate. Somewhere along the culinary trend highway, Chicken and Waffles became a thing, and as odd as that sounds, people tell me it's a killer combo. Wasn't it inevitable, then, that some clever chef would find a way to take this upscale and make it their own creation? I guess that's what happened here, because III Forks executive chef Dylan Hauge served us this plate of Duck & Waffles - napped with creme fraiche, and studded with pistachios and port wine cherries.And let's don't forget the micro-greens. Pretty! I went for seconds on the Duck and Waffles.. Want more now. Seriously, this had the sweet crunch of the gaufrette and pistachio, the rich savory note of the duck, tangy creme fraiche, and the tart, soft port wine cherries. It was, I felt, the most perfectly composed dish of the evening. I counted five to a plate - and you could nosh each one down in two or three bites. Perfect snack / light meal. I THINK they are $12.95 but the online menu says $7.95. Bargain at either price. 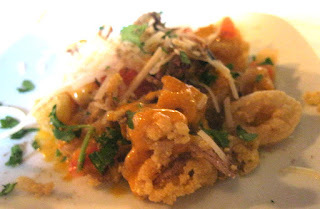 Pair this with a classic Pinot Noir. You may be thinking this menu is all dainty bites and trendy ingredients like taro chips and duck waffles, but you'd be wrong. VERY worth noting are two full sized and straight-forward sandwiches - both the Prime Burger and the French Dip were very satisfying dishes - served with a side of fries, Manly-man style. I preferred the French Dip - soft shavings of Prime Rib with balsamic glazed caramelized onions, roasted red peppers, and creamy horseradish sauce. The bakery-style roll was delicious too, not to huge - good flavor, with just the right amount of chew and a lightly crisped crust. Say THAT three times fast while slugging down a glass of your favorite Cabernet! The burger was good too - a mountain of food. If you want beef but a lighter portion, try the III Forks Sliders - two for $8.95. In addition to these items, there is a Wedge Salad Wrap which I thought was a little clunky, but then I don't usually eat salad with my bare hands. An Artisinal Cheese Plate looked great and featured local / regional cheeses, which I very much appreciate. Ahi Tuna was blackened, sauced maybe a bit heavily, and served over what was billed as an Asian Slaw, but looked a lot like roughly shredded lettuce. While it was impeccable quality tuna, the preparation seemed a bit basic, as if it was just tossed in there to represent the denizens of the deep. Steak Tartare ($19.95) was predictably good tenderloin tossed in a mustard aioli, served on a himalayan salt plate... which is uber-trendy but then here goes my whole "Oh, I'm not really a germaphobe" argument out the window. I would have been fine had someone not asked the question - the answer to which was that they just scrub / wash these plates off after each serving and reuse them. I know, I know, they have natural anti-microbial qualities, they're the craze of chefs everywhere, but I am skeeved by a plate you can't boil the bejeebus out of with good old soap and hot water. I guess I like my salt in and / or on top of the food, not seeping up under it. Call me old-school that way. On the other hand, plop it on a clean white plate and I'll gladly eat raw beef, so go figure. Rant over. food we had been served up to this point! We were served a tasting sized trio of the house desserts - which aren't on the Bar Bites menu but I'm sure if you asked you could get them. They were all sooo rich and decadent. 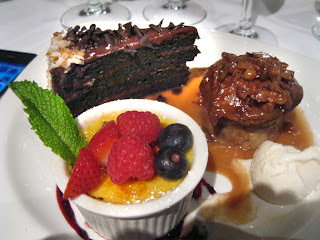 I'm not a mega-fan of bread pudding, so I gave it a couple tentative bites, but the chocolate ganache cake was devoured, likewise the creme brulee. Momma mia! I just want to reiterate - this was a complimentary tasting of items on the Bar Bites menu, and we were treated to stellar service from the staff, and received generous attention from General Manager Pete Nebrich, Executive Chef Dylan Hauge, Sous Chef Andrea Williams, Special Events Manager Kelley McGlynn, and III Forks charming and knowledgeable Sommelier and Assistant General Manager Jeremy Vass. Big, big thanks go out to the whole crew at III Forks for making us feel like special guests. A friend and I were recently invited to dine at Cantina Laredo in the St Johns Town Center. I had been a few times before, but not recently. On this occasion we were guests of the General Manager, and we were treated to a feast for the senses. I'll share a few of the highlights of this visit with you - and I hope you'll plan to see for yourself how they do the things they do! Happily, I was first to arrive, and since there was a space at the bar, it seemed like a great plan to start our culinary adventure there. 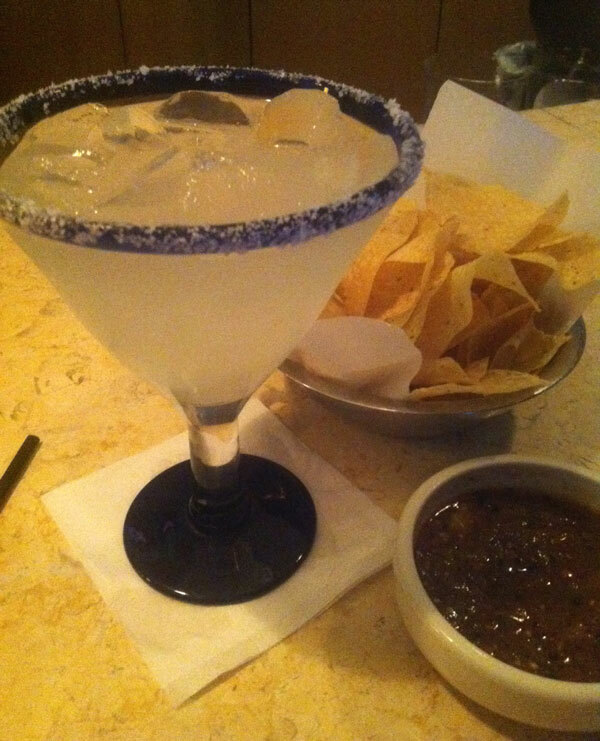 Margaritas are an art form at Cantina Laredo. I began with a signature drink - The Casa Rita - a premier blend of Giro Silver Tequila, Cointreau and fresh-squeezed lemon and lime juices, which rolled up in a giant glass for just $8.00. Heavenly. If you're not a fan of the Margarita, try one of their mojitos, or sip some wine - they have a lovely selection by the glass or bottle. Slip into a top shelf Tequila, or go for one of their Mexican beers. While I'm on about the drinks - a warning - this bar usually gets crowded with patrons waiting for their seats, so if you like the chips, dips, and 'Ritas scene, come early and camp out. When my friend arrived we were seated immediately and treated to a lovely meal, but I will confess up front, next time, my visit will begin and end at the bar. That's just how I roll. Bring on the Queso Laredo, baby! Warm and cheesy, garnished with taco meat and pico de gallo - $9.29. A freshmade salsa duet comes standard with the Chips and Dip - one warm, one cold. Warning - there is actual FLAVOR in these! So much so that we scarfed down something like three bowls of chips before the night was through. Definitely a hit. This brings me to another point about Cantina Laredo. They seem to have figured out that we dine with ALL our senses. Taste has to be spot on, sure, but there's a lot more going on here than how something tastes. 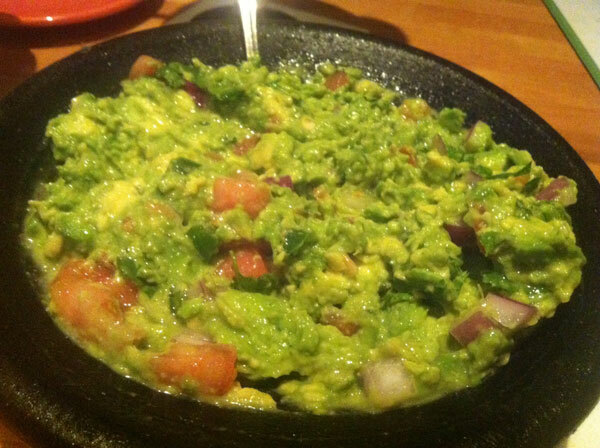 The texture of their Top Shelf Guacamole can be experienced only after you watch your server transform fresh avocado, onion, tomato and lime - at tableside - into this luscious, creamy, chunky dip. They say it serves two or four for $9.99. Don't worry, if you can't finish it, take the rest home and mix it into some scrambled eggs the next morning. Heaven! While we were perusing the menu deciding on our main course, a sizzling, steaming plate passed our cozy booth and was served to the folks next to us. The scent of warm butter, cinnamon, and apples filled my senses and - for just a moment - transported me back in time to my great grandma's house in Missouri - hanging out with her in the warm kitchen, waiting for the pies to bake and cool. That fiesta for the senses was their MEXICAN APPLE PIE - Sizzled in Mexican Brandy Butter and topped with your choice of cinnamon or vanilla ice cream - $6.79 - a small price to be transported into a happy place! I soon snapped back and selected my main course. 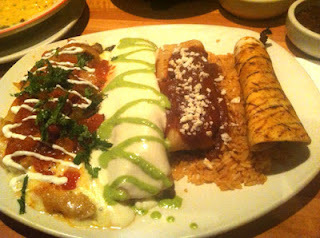 Wanting to sample it all - I chose the CANTINA LAREDO PLATTER - Oaxaca cheese chile relleno, tamale, chicken enchilada, fajita beef taco al carbon - $17.79. While it was festive to look at, and some of the pieces were tasty, I was a little dissapointed in my selection. It's not that the platter was bad, it was just a bit bland, and seemed to have been assembled on the plate, each item perfectly rolled and decoratively sauced. And at the end of the day, that's a lot of tortilla, cornmeal, stuffed with little bits of beef and chicken. Instead, I recommend one of the grilled meat selections - they have an awesome sounding CASCABEL RIBEYE *16 oz. Certified Angus Beef cowboy cut bone-in ribeye aged 21 days then basted with Cascabel marinade for $25.99. or the PESCADO del Dia - grilled fish of the day (market price). They have some nice-sounding chicken and shrimp options too. Word up - leave the stuffed, rolled and folded items to any of the awesome taquerias in town. They do it better and cheaper. Still, if enchiladas or tacos are your thing, they've got quite a selection. My dining partner ordered the evening's special, a variation on the CARNE ASADA - Grilled steak with marinated onions and chimichurri sauce, tomato, peppers, and was pleased with her choice. She ate half and took the rest home for a perfect midnight snack or accompaniment to eggs in the morning. About now we needed some liquid refreshment, and the establishment brought us a couple of their faves. The MILAGRO BLACKBERRY SMASH- Milagro Silver, lime and mint, muddled with blackberries and agave nectar - $11.75 was a smash hit with me. Again, transported. Blackberries send me back to a time in my youth when we were frequent visitors to Knott's Berry Farm. Only this time, my favorite berry soda had some real kick to it! Then there was this concoction - a Margarita with a corona sidecar - what the??? LOL. We had a few sips, but we were puzzled by why anyone would want to mix beer and Margarita. My friend, who has been traveling extensively in Texas lately, tells me these are quite the hit there. Her take on it is that it's an attempt to get men to order Margaritas without feeling less macho. She may be on to something, but the baby-bottle of beer would seem to negate the effect. I think Corona was trying to horn in on Margarita sales, and invented this crazy beer-holder-ring, and the rest was history. This drink cannot fade into history soon enough for me. Sorry. I like my corona ice cold with lime wedge, not diluted in my Margarita. Still, something interesting to look at - and it turned heads entering the room. With the memory of that steaming, sweet apple pie still fresh in my mind, we moved on to the Postres. Since we were stuffed to the gills already with chips, salsa, dips, main course and drinks, we decided to share one MEXICAN BROWNIE - served with pecans and walnuts on a sizzling skillet with Mexican Brandy Butter and vanilla (or you can choose cinnamon) ice cream - $6.99. Smells like the best ever brownies baking. Our hosts insisted we try one of their signature coffee drinks - also made tableside - the name and particulars I have forgotten, but the spectacle of them making it was something else - they pull up a tray FULL of liquors, coffee and toppings, and they do all but whip the cream at your table. Liquors are poured, then set aflame, with cinnamon tossed in to send blue sparks flying through the air while the server whirls the glass around for all to see. It was like enjoying our own private fireworks at the end of the meal! Seriously, if you like to be the center of attention a little bit when you go out, ask for that Mexican Coffee concoction they make at the table. It was so good, too. Drank every drop. Wow - looking back on it - that was a lot of food and drink for two people! MUCHAS GRACIAS to our hosts for a lovely evening - great service - good food - and all the little touches that set Cantina Laredo apart from the crowd. Try it for yourselves - if you've been for dinner already, maybe hit up their Sunday Brunch next time, or go for drinks and dips, or go all in Texas Hold'em style! Take los niños along - they've got a special menu complete with activities for keeping little ones busy between courses. AND - if you go today (Sept 2, 2012) or tomorrow (Sept 3, 2012) you can shave three bucks off that Casa Rita with this coupon! Ole!